Custom long-arm machine quilting with an APQS Millennium hand guided quilting machine. 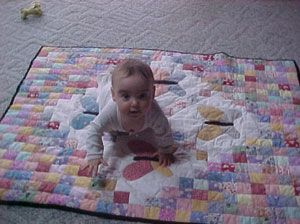 Be sure to check out the custom and fun quilts. The service page will inform on how the quilts will get picked up and delivered and my pricing. I do quilts for people that I ship to. Most of my clients live in Illinois, but I ship to Indiana, Michigan, Wisconsin, Missouri, Nebraska, and Texas. I'd love to get quilts from all 50 states. Please contact Crystal, my daughter, the webmaster if you find any errors in the site. Thanks Crystal!